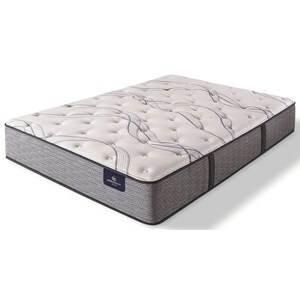 This Serta Perfect Sleeper Mattress offers custom support with the 1,000 Edition Custom Support Coil System. These Individually Wrapped Coils contour to your body offering excellent support. Two rows of denser coils on both side of the mattress provide extended mattress surface use and a firm sitting edge. Specialized Foam, Engineered Fibers and a super stretch premium fabric provide pressure point relief. Additional heat-regulating fabric helps keep you cooler. Cool Twist™ Gel Memory Foam adds support as it disperses heat letting you sleep calmly and coolly. Sleep well on a Serta Perfect Sleeper. Browse other items in the Trelleburg II Plush collection from Belfort Furniture in the Washington DC, Northern Virginia, Maryland and Fairfax VA area.